Honor View 20 comes loaded with a 6.4-inch Full HD+ All-View display with a 2310 x 1080 pixels resolution, 91.82 per cent screen-to-body ratio, 19.5:9 aspect ratio and 382ppi pixel density. It is powered by Kirin 980 processor with 720 MHz ARM Mali-G76MP10 GPU. Huawei’s sub-brand Honor has today launched its flagship Honor View 20 in India. The smartphone comes in two variants - 6GB RAM and 128GB internal storage priced at Rs 37,999 and 8GB RAM and 256GB internal storage will cost you Rs 45,999. The Honor View 20 available on Amazon India starting January 30. The phone will be available in Midnight Black and Sapphire Blue color options. The major highlight of the smartphone is the new punch-hole display. Honor View 20 comes loaded with a 6.4-inch Full HD+ All-View display with a 2310 x 1080 pixels resolution, 91.82 per cent screen-to-body ratio, 19.5:9 aspect ratio and 382ppi pixel density. Under the hood, the smartphone is powered by Kirin 980 processor with 720 MHz ARM Mali-G76MP10 GPU. It also features a circular fingerprint sensor at the rear. The Honor View 20 sports a 48-megapixel Sony IMX586 sensor with f/1.8 aperture, 960fps slow-motion video recording support, autofocus, AI HDR, and LED flash support. There's a secondary 3D Time of Flight (ToF) sensor for 3D applications and mapping of objects. The phone features an AI-powered 25-megapixel front camera with f/2.0 aperture and fixed focus support. The front camera has a diameter of 4.5mm and is placed under the display at the top-left corner. The Honor View 20 will run on Android 9.0 Pie based Magic UI 2.0.1 out of the box and it will be fuelled by a 4,000mAh battery with 22.5W (4.5V-5A) fast charging. The device features a Link Turbo technology that combines both 4G and Wi-Fi networks to boost download speeds. It also supports GPU Turbo 2.0 technology for boosting performance while gaming. There are various connectivity options which include Dual 4G VoLTE, Bluetooth v5.0, Wi-Fi 802.11 a/b/g/n/ac (dual-band, 2.4GHz and 5GHz), GPS/ A-GPS, USB Type-C, and more. 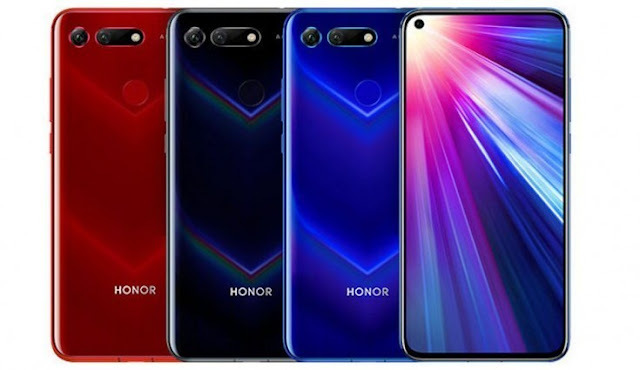 0 Response to "Honor View 20 with 48-megapixel rear camera launched in india | starting price Rs 37,999INR"